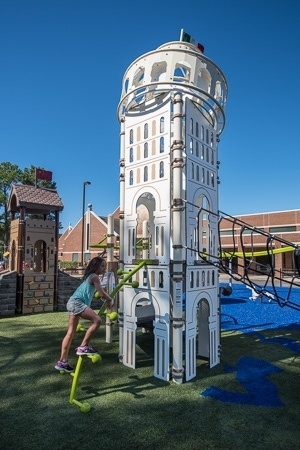 Carolina Parks and Play applauds Landscape Structures’ Rep “Recreational Concepts” in Tennessee on their world-themed playground in Memphis, TN! This playground is truly inspiring! The Lausanne Collegiate School playground includes 14 different playstructures that represent a tour of the world on safety surfacing designed to mimic a world map. The playground includes the ZipKrooz™, which takes students from the Horn of Africa to Australia. 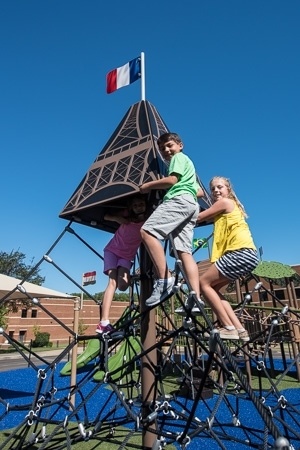 Climbable replicas of Big Ben, the Eiffel Tower and the Taj Mahal provide opportunities for kids to interact, engage in imaginative play and discover the world beyond them while staying active. Click here to learn more about what Product Lines are featured in the playground! Click here to request more information from Carolina Parks and Play.